These elbows are statically cast in a variety of HRCS alloys. The elbows are cast then machined with a weld prep bevel prior to being high-pressure hydro tested and LPI inspected. By keeping the track of the latest market trends, we are engaged in manufacturing, exporting and supplying an exclusive range of Elbow Pipe Fitting. - Used in water supply pipe lines, industrial food processing pipeline and in various other fluid transfer piping systems. Material Standard: ASME/ANSI B16.47,B16.48,B16.5, B16.36,B16.9, B16.28, MSS SP 43, MSS SP 95. We are the manufacturer of Cast Iron Elbow Fittings. To attain maximum client satisfaction, we are engaged in offering PFA Lined 45 Degree Elbows. Our offered elbows are made from supreme quality materials employing novel technology to make sure of its quality features. To meet the exact demands of our clients, we offer the entire range in different specifications. Backed by a team of skilled and experienced professionals, we manufacture and supply a massive compilation of Buttweld Elbows. For the manufacturing process, supreme quality raw materials are used. Offered elbow fittings have fixed flange on both the sides. We offer these at reasonable prices. 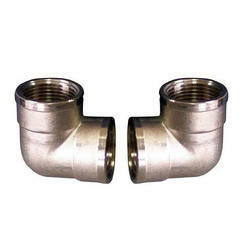 We are engaged in manufacturing and supplying a wide assortments of 90 Degree Elbow Pipe Fittings. Our range of elbows finds application where pipe is needed to bend at 90 degree. For this reasons it is also known as 'quarter bend'. Fabricated in many sizes and dimensions, our elbows are available at competitive prices. 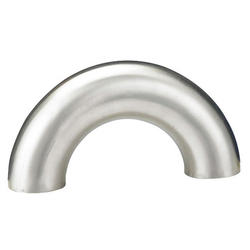 We offer male elbow tube fittings with twin angle change in the direction of the tubing run. These tube fittings are available in variety of materials. A Pressure Balanced Elbow Bellow assembly is designed to absorb axial movement and/or lateral deflection. while absorbing pressure thrust. This is achieved by means of tie rod restraints that connect a line bellows with an opposed balanced bellows also subjected to line pressure. This type of expansion joint can only be used at a change in direction of the piping system. Shakti Bellows & Hoses Mfg. Co.